KUCHING: The development programmes of all sports in Sarawak will continue to receive the support from Sarawak Sports Corporation (SSC) and Sarawak State Sports Council (MSNS). This was mentioned by SSC chief executive officer, Dr Ong Kong Swee who said it is the objective of SSC and MSNS to make Sarawak a sports powerhouse in the country. 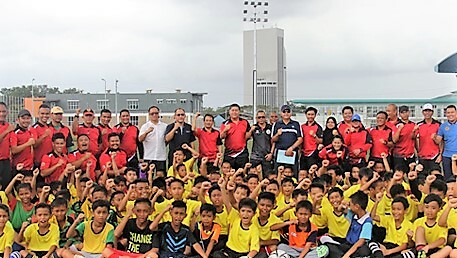 “We will continue to support any activity that is involved in the development of all sports in Sarawak, especially at grass roots level,” he said at the opening ceremony of the Sarawak Youth Football Clinic held at Padang C in Petra Jaya on March 10. As a coach himself, Dr Ong said for any sport to be successful, three criteria namely coaching, technical development and the players are very important. 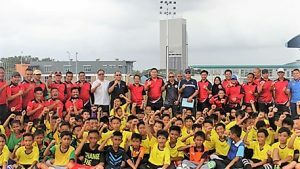 On the football clinic for Under 12 players, Dr Ong said it would be continued to be organised with the collaboration of Football Association of Sarawak (FAS), Football Association of Malaysia (FAM) and Sarawak Education Department (JPNS). A total of 97 participants turned up for the clinic that ends on March 11 and according to the organisers similar clinics will also be held at SMK Lanang in Sibu from March 17 to 18, and at SMK Merbau in Miri from April 28 to 29. Also present during the launching of the development programme were FAS president Dato Posa Majais, FAS vice president Abang Suhordie Abang Zaini who is also chairman of FAS development and technical committee and JPNS Sports Unit officer Ashley William Kutoh.